← The food revolution is all around you! Today is Veterans Day. It’s a quiet Sunday morning as I write, but quieter still for those who’ve given their lives in supreme sacrifice to their country. Not so for the many maimed physically and psychologically by war who must live daily with its ravages. I think more recently of Iraq and Afghanistan, those strange sounding names of places so far away most of us scarcely knew they existed, save a chance photo spread in National Geographic while waiting in a doctor’s office. Places now as familiar as weekday names. and muse through their sideburns. . .
A decade ago I visited our war dead at Colleville-Sur-Mer, where the elevated resting place of our Normandy heroes overlooks that once bloodied Omaha Beach. 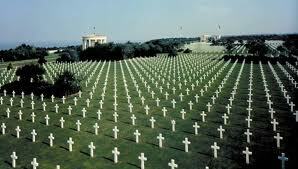 Ten thousand, row upon row, their graves facing Westward to their homeland, their life threads severed early. They would not see America again or wed or become parents or enjoy the rarity of a warm November day. Mortality is our collective lot, but for these, the shades were drawn early. 12 p.m, and the malls have just opened. Veterans Day, like Memorial Day, now serves as commercial fodder, or like the Mosler Safe in a culture that’s found new servitude in the material quest. Nixon ended the draft back in 1971. So now it’s become easier to forget those who defend, bleed and die for us. I was a young fellow, a former veteran, during the Vietnam era of national division over a far-off war, spilling over into public defiance and, sometimes, violence at home. Vietnam was a very long war. Until Afghanistan. Where are today’s protestors? How much easier to rent surrogates. It’s a beautiful fall day, an Indian Summer day, the autumn maples ripe in their red dress. The malls will do well.